A group for all warhorses in DA stables, from HARPG, free stables, real breeds and fantasy breeds. Tired of not being able to find a show in your favorite warhorse discipline? Trying to get your warhorse some quick show experience? All-Warhorses hosts a continuous effort warhorse show! This show is open to any mount trained in warhorse disciplines; bring on your warcamels, elephants, fawnlings, Rukaans, Peegs or any other that you'd like! -- Spring is here! Wildflowers blanket the fields; reds, oranges and yellows of lantana, mexican hat and indian blanket flowers predominante. -- Single horse event, no ghost horses required. --There are multiple kinds of "quintain jousting", any will be accepted. Give your horse some barding for bonus points! -- You will be asked to retrieve items including a handkerchief, several wooden stakes, wooden rings and pieces of cork using a spear, sword or similar weapon. -- Held in hilly, rocky and wooded terrain. The sun is shining and the brooks are babbling! --Armor is suggested for safety purposes! --Held in an open pasture. Don't put anything flammable too close to the dragon! Background can be anything you like, it is up to you, but you must include the specified detail. 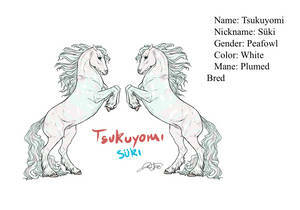 If less than 3 entries are received, ghost horses will fill the roster. Ghost horses may be auctioned off later. Headshots/backgroundless entries will be accepted, but will get less points for effort than a complete entry. Tracing is not allowed. Photomanips are allowed but all portions of the image must be credited. Ghost horses will fill empty slots if fewer than 3 entries are received in a class. Ghost horses will roll a random score out of 40 points. 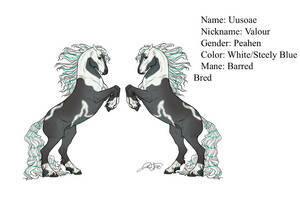 Current ghost horses are listed below. Ghost horses will eventually be sold by the group. If they are available, that will be posted on their references. If you need an opponent for mounted combat, jousting, or any other event you may use a ghost horse to fill that role. All results will be saved in this journal for record-keeping purposes. Don't worry, we will never delete proof of your placement. Please - research on the event you want to enter a little if you need to. Pay for example attention on what riders and mounts “should” wear to give your image a realistic touch, like helmets, outfits, special tack (or none at all) for the horse etc etc. The more accurate, the higher judges bonus (1-10) you will get. I spent a good deal of time looking up information for the classes that might (hopefully be fun) so I hope you do the same. - be sure to note what class or phase your entery depicts, thanks! Most eventpurses are inspired by the WEG '18 in Tryon, USA. The Derby is inspired by the Falsterbo Derby, Sweden. The Equine Agility, Rings & Pegs, Trail, and Jousting have been given a purse by me. I have a natural colored draft lady whose breed group has sadly closed down and I'm hoping to find another breed to transfer her to. The only things that need to stay the same are the basic color/design and a height of 20-25hh. Her rider is a 9' mountain troll so she kind of needs the heft Active warhorse type breeds with free or cheap custom imports would be ideal. If anyone has any suggestions please give me a yell! Chief's Quick Peafowl Sales- OFFER TO ADOPTHello all! I've decided I really need to slim down on my peafowls, so I'm going to sell some of them on an offer basis! Just comment below with the horse you're interested in, and you'll hear a response in the next 24 hours on whether it's been accepted! 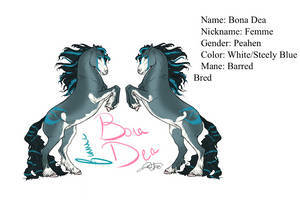 I reserve one breeding spot to all the horses soldLove love love these beauties for me!!! Some examples of our warhorses in action! You can submit your own favorite pieces to this folder. We are a group for all horses trained in the warhorse disciplines, real and fantasy. As a group, we hope to provide a community with resources, shows, and anything else our members might desire. We accept affiliation with other discipline groups, equine art-roleplay related groups, and breed groups which might be appropriate to be trained as warhorses. We only affiliate with groups that have an icon. first of all it says "they must be trained in warhorse disciplines" so does that mean they have to have training pics? so instead of "contribute art" would be it go thru "suggest a fav" ? and if u have normal pics that aren't registration things, do they go under the featured section? 2) Yep, they're fine! A mature warning on the piece would be great if it's needed. 3) It was set up that way so watchers wouldn't be flooded with deviations but could look through them if they want to. That's a good idea though, I'll add a "member warhorse art" folder to the gallery so people can submit stuff to it. yeh i thought about not bothering when i saw that it's only for favorites. :/ cuz i feel like the point of a group is to get in touch with other people who like the same thing, like if i watched the group, i would do so because i WANTED to see warhorse related art or be notified of people who owned horses like that. i don't imagine anyone is gonna look through the group favs unless they are coming upon the group for the first time and checking everything out for curiosity but even then, i tend to not really look at people's favorites... and i can't imagine anyone regularly bringing up all the groups they are a part of just to see if the group added any new favorites lately. when i found the group i was like aw awesome yay cool! but then i saw it's all just favorites and nothing is actually submitted, no one will see what i post and i won't see anyone else's stuff unless i come to the group on my own to look through the favs on a regular basis... and that was disappointing :'c and i actually decided not to bother after that ;;" except i guess the focus is on related shows and such and that is still interesting but i'm afraid it might not work for us? i mean... we have a lot of warhorses, but they all exist in ancient times ;;" i don't think it'll make sense for us to enter shows where they compete with present-day people unless we make up a time-travel device ( which we've considered just for the silliness and fun of it lol ) but anyways yeh, i had mainly hoped to show them off to people who shared a mutual interested in battle horses ;;"
I've got a new breed that I'm working to get noticed and around! They are a war horse breed of many sizes. I've aded them to the list! I hope this group is still active, because I've mountains of entry sketches waiting to get drawn. Why didn't I know about this group earlier, I'm always late lmao.